Financial Management of european funded projects does not require you to be creative and experienced for doing your task successfully. 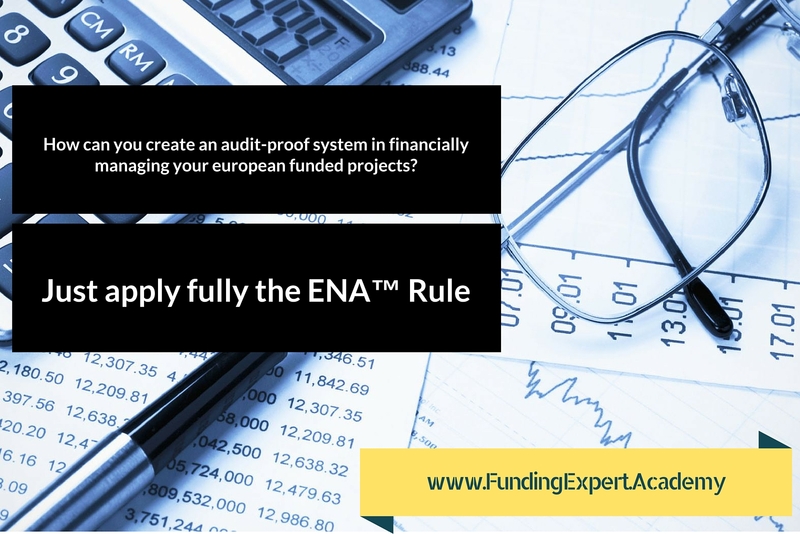 You mainly need to apply fully and comprehensively the ENA™ rule in each of your project expenses in order to be considered eligible. This rule is simple but very powerful for developing an audit-proof european funded project. I elaborate further on that rule a little bit later. You only need to consider now that the ENA™ rule is very easy to apply and it is not like developing a proposal for funding that requires a very good network and experience in how to apply the FETP™ recipe (see more info about this recipe at my previous article on Why you cannot afford to fail and how to succeed in european funding. Around 980€ billion till year 2020 are distributed to organisations as financial support from the EU budget. These organisations are desperate (some of them maybe haven’t realised it yet) of skilled financial managers for ensuring sound financial management of the received EU funding and there will be no rejection of claimed costs and consequently return of some funding after the financial control by the EU or after an EU external audit. As a reminder according to the EU Financial Regulation 966/2012, all projects that receive a grant higher than 60,000€ can be externally audited up to 5 years after the end of the project. A: Actual (to have actually taken place and properly recorded and paid). That is the ENA™ rule that although it is common sense, it is not common practice. Unfortunately, most of the individuals that are involved as financial managers in european funded projects do not apply this rule or they are not aware how to apply it properly and fully. The consequence can be your worst nightmare. Part of your claimed costs or in some cases all your claimed costs can be rejected by an EU financial control or more commonly by an external audit. Can you imagine your organisation being involved in a european project that has been fully implemented from the technical point of view and in some cases with great achievements but on the other hand after it has been externally audited by the the EU, the audit findings oblige your organisation to return the received grant, because the ENA™ rule hasn’t been applied fully? This a really bad nightmare that unfortunately has become a reality for many organisations because they haven’t applied intentionally or even unintentionally the ENA™ rule properly. Consequently, organisations had to close or suffer big financial challenges with the requested returns by the EC. In case you want to develop further what you have discovered in this article and exploit fully and become a pro in european funding and financial management, you are strongly suggested to join any of my Funding Expert Academy programmes by registering first for free to receive free educational videos that will make an eye opening experience for you.